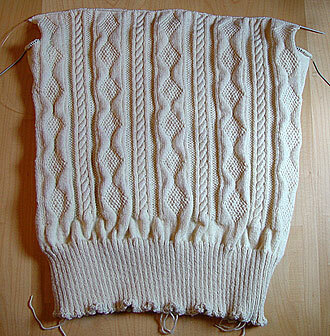 As predicted, I’ve completed the first half of the gussets and divided front and back. 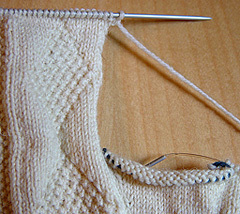 The gussets got to 21 stitches wide, with an extra knit row (whose purpose I’ll explain when I get to the arms), and were then placed on holders. I use old, leftover balls of guernsey 5-ply as temporary stitch-holders, usually in a different colour to make it easier to tell the holding yarn from the stitches. (This time I’m using leftover “conifer” green from my abortive Cornish gansey attempt.) The only downside is, if you’re not careful, some stray strands of the holding yarn can get caught in the stitches when you put them back on a needle; so there’s a risk I might end up with a faint line of conifer green running across the middle of my nice cream gusset. 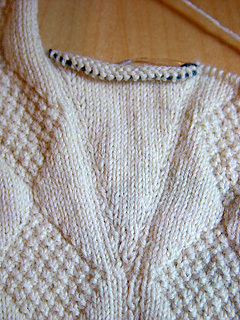 I usually do the back first, up to the shoulder join: this is partly to get me used to working the pattern back and forth on the half that will be less noticeable – unless someone is standing behind me in a queue with nothing better to do than stare at the back of my pullover (in which case, ha, let ’em) – but it also has the advantage of deferring any decisions about the neck (e.g., how deep to make it, where the best place to interrupt the pattern would be, etc.) that little bit longer.